Read senior columnist Neena Hagen’s counterpoint column here. From coffee shops to major airlines to local governments, every vein of public life seems determined to declare war on plastic straws. Corporations such as Starbucks and American Airlines began the trend, promising to phase out usage of straws in all of their locations in the next few years. Just last month, Seattle, Santa Barbara, Calif., and San Francisco all jumped on the bandwagon, banning the sale of straws at restaurants and other food distributors — in Santa Barbara, a violation could put you in jail for up to six months. This move is a positive one — plastic straws are the 11th most common plastic item found in ocean garbage. It is also attainable as similar efforts to reduce plastic bag usage have been successful, suggesting straw usage can be cut down through various regulations to help decrease pollution in our oceans. Straws are inherently wasteful — used once and then tossed out. According to the market research firm Fredonia Group, about 390 million of the small plastic tubes are thrown away in the United States every day. This might not be as much of an issue if plastic straws could be recycled, but that is impossible in most places. Like plastic eating utensils and bottle caps, straws are too small to recycle properly. They quite literally fall through the cracks at sorting facilities because the machines are designed to filter larger items like water bottles. And a straw’s lifespan is long — the two most common plastics used for making straws, polypropylene and polystyrene, can take over 450 years to decompose. This means that once a straw ends up in a landfill or the ocean, it will still exist when the initial user’s great-great-great-great-great-great-great-great-great-great-great-great-great-grandchildren are walking the earth. Plastic straws are an ever-growing presence in our oceans and are extremely harmful to marine animals. Plastic ingestion contributes to the deaths of 1 million seabirds and more than 100,000 other marine animals each year, according to the United Nations. Research by the Ellen MacArthur Foundation estimated that by 2050 the ocean will contain more plastic than fish if current trends continue. And this, in turn, carries over to us. The Ellen MacArthur Foundation found people who regularly eat seafood already consume plastic particulates found in seafood as a result of marine life swallowing plastic in the ocean. Consuming plastic can lead to chemicals being stored in the body and cause everything from birth defects to cancer, according to the Ecology Center. 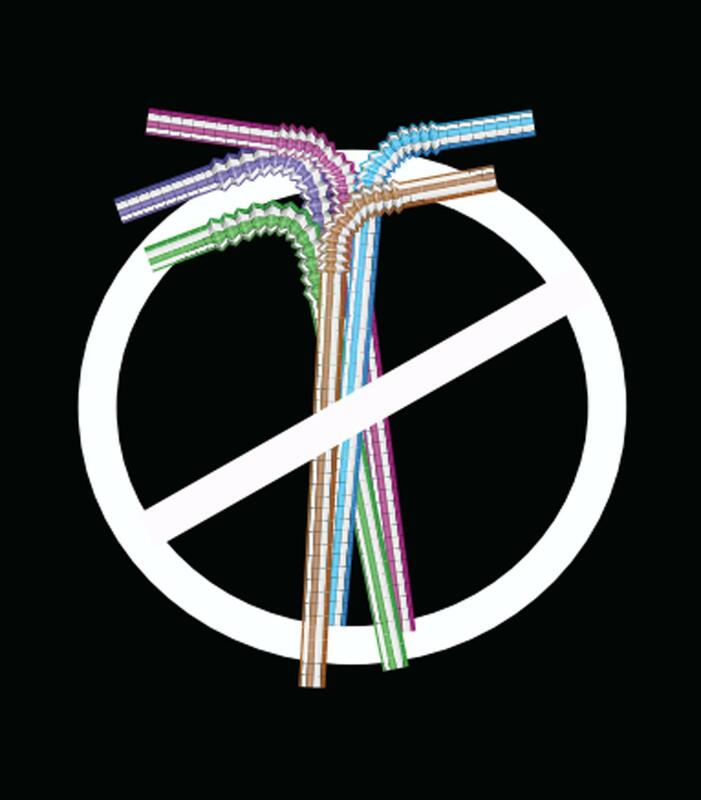 For most people, using straws is not a necessity — but a common legitimate concern about banning straws is that those with disabilities who rely on plastic straws will be unable to enjoy drinks in restaurants and cafes as a result. In response, cities and companies should create policies allowing eateries to keep a small supply of plastic straws on hand for those who require one. Similarly, straws made of reusable materials such as steel, bent glass and bamboo, or compostable materials such as eco-friendly paper could also be offered to everyone. While banning plastic straws from many places may seem like it’ll hinder day-to-day life for a lot of people, this is unlikely considering how people have adapted to other eco-friendly prohibitions, like those on plastic bag. San Francisco achieved a 72 percent reduction in usage of plastic bags by banning single-use plastic bags — people simply started to use cheap, reusable bags. Pitt has taken similar steps on a smaller scale — Market-To-Go and the University Bookstore introduced charges for plastic bags in 2017 in an effort to deter consumption, offering cheap reusable ones in their place. The switch, according to Pitt Sustainability Coordinator Nick Goodfellow, achieved a 95 percent reduction from students using 30,000 bags a week to 500-800 bags a week. Forty countries worldwide have already banned, partly banned or taxed single-use plastic bags, many of which were replaced by supermarkets offering cloth alternatives. Kenyan officials reported that after enforcing the ban in their country, their streets became cleaner and plastic was found less frequently in the stomachs of animals. In order to help both life on the ocean and on land, banning straws cannot be the only measure taken to assist in environmental conservation. Hopefully the energy of this trend will snowball and people will begin calling for companies and cities to ban and replace other major contributors to plastic pollution, such as plastic packaging, with more eco-friendly options. Kraft Heinz is already taking a step in this direction — it recently pledged to make 100 percent of its packaging recyclable, reusable or compostable by 2025. While plastic is currently a daily commodity, it also causes great damage to the environment with each passing day. Whether banning straws makes a noticeable impact or not, it is an important first step in cutting down on the use of single use plastic products that have already cost our world so much. Public awareness is key on the long journey to a less polluted future.